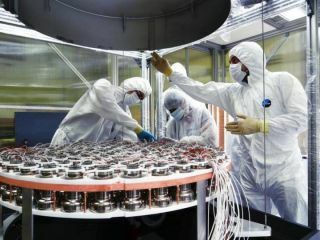 Researchers used the XENON1T dark matter detector to establish the limit of the effective size of dark matter particles. In the quest to understand dark matter, scientists have now determined that the effective size of dark matter particles — how strong their interactions with regular matter are — must be smaller than we thought. Using the XENON1T dark matter detector, researchers have produced experimental results that establish the most stringent limit to date for the effective size of dark matter particles. This detector, the most sensitive instrument of its kind, was able to limit this size parameter to 4.1X10-47 square centimeters, which is 1-trillionth of 1-trillionth of a centimeter squared. Additionally, because two background events — like radon contamination, neutrons being produced in the detector environment, or gamma rays contamination — were predicted to occur in the detector but none did, it suggests that dark matter particles are smaller than had been expected, Ethan Brown, a member of the XENON Collaboration and physicist at Rensselaer Polytechnic Institute in New York, said to Space.com. These experimental results were presented Monday (May 28) at a seminar at the Gran Sasso Underground Laboratory (LNGS) in Italy. The detector uses liquid xenon and, whenever a dark matter particle collides with a xenon nucleus, if scientists' models are correct, the collision should produce a small light flash — a rare opportunity to "observe" dark matter. Researchers theorize that dark matter is five times as abundant as regular matter, but we still understand very little about the secretive substance. However, many scientists suspect dark matter is made of bodies called "weakly interacting massive particles" or "WIMPs" — particles that have a minimal reaction when encountering ordinary matter (like the faint light that flashes when WIMPs pass through a dense collection of xenon). While the existence of WIMPs is not yet confirmed, it is a leading description of the elusive, invisible material. These experimental results are the culmination of 279 days of data, Elena Aprile, a project leader from Columbia University, added in the statement. Following this experiment, researchers will aim to reduce background events like radon contamination in the system, according to the statement. This way, the system will be able to detect even smaller, rarer interactions from these mysterious "particles."